"Sadly, everything comes to an end." Update: An Epic spokesperson says that leaks were not the reason why FNBRLeaks was sent a cease and desist letter. The cease and desist letter, which you can read below, mentions both leaking and data mining, however, so it must have been a factor. It also demands Preston cease and desist from "distributing any technology that circumvents security measures", which presumably covers the mod tools. 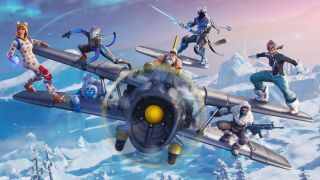 Original story: Prolific Fortnite sleuth and leaker FNBRLeaks has closed its social media and GitHub accounts after apparently receiving a cease and desist letter from one of Epic’s lawyers. On Twitter, the account made a few final tweets before blinking out of existence, while a longer statement was posted on TwitLonger. 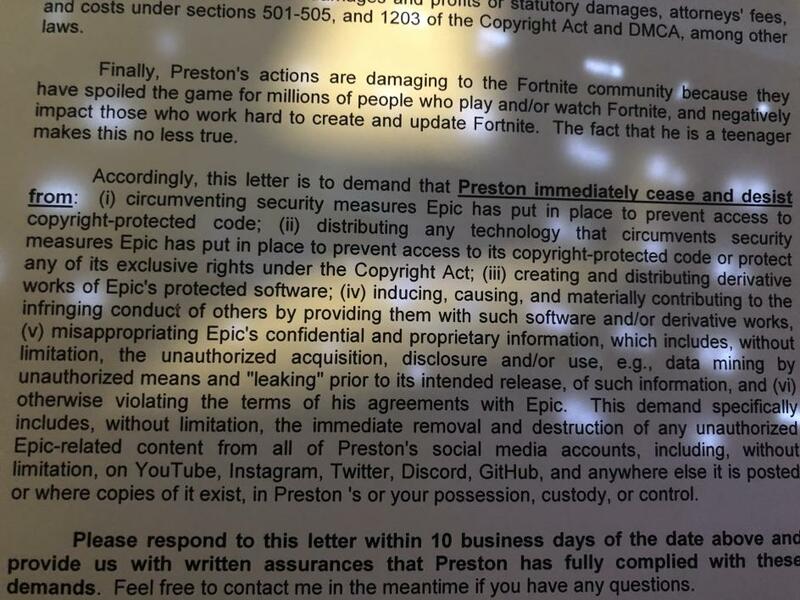 “Due to the request of an Epic Games Attorney who i'm not going to disclose, my Twitter, Discord, YouTube, Instagram, and GitHub must be deleted, or else they will take action,” Preston, FNBRLeaks’ owner, wrote. “Thank you all for the support and followers over my 7-month span of the FNBRLeaks twitter. Sadly, everything comes to an end." The FNBRLeaks Instagram account hasn’t been closed yet, however, and the website remains active. The letter was posted on the FNBRLeaks Discord shortly before it was shut down (thanks, Eurogamer). It demands that Preston cease and desist circumventing security measures, data mining or disclosing unreleased information and a host of other things. It doesn’t demand that FNBRLeaks’ Twitter, GitHub or any other account be deleted, just everything on them that's related to Epic, which is effectively the same thing. FNBRLeaks gave us an early glimpse as a lot of stuff coming to Fortnite, from datamined cosmetics to dynamite, but the cease and desist argues that, in doing so, Preston “spoiled the game for millions of people". Judging by the ravenous hunger players have for even the smallest slivers of information, they might disagree.